Raw image data capture with less noise than was available for JPEG file capture. 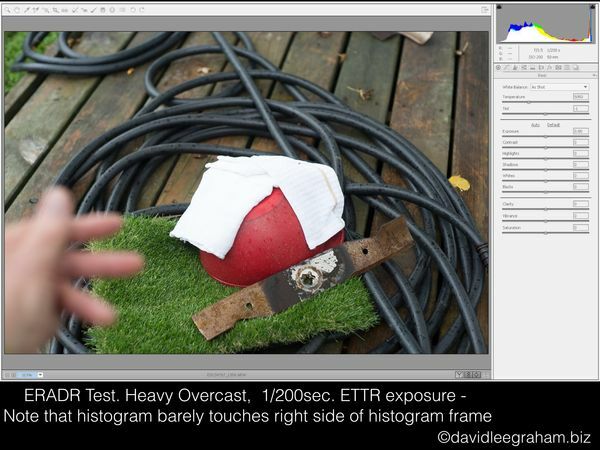 How to determine how much extra dynamic range your camera has for Raw exposure. Extra Raw-accessible Dynamic Range (ERADR) your camera possesses. 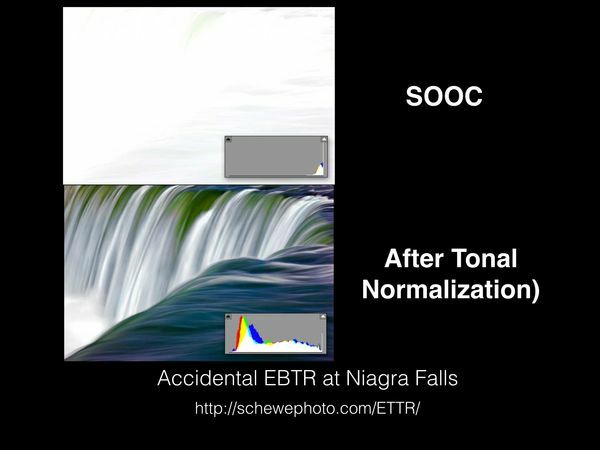 Every one of the 30-plus digital cameras I've tested so far (by examination of properly prepared ERADR Evaluation Exposure Series) has had at least 1/3 stop to over three stops of Exposure Value (E.V.s) beyond the clipping exposure indicated by the on-board histogram! That's a lot of available exposure to leave "sitting on the table" ignored and unused! 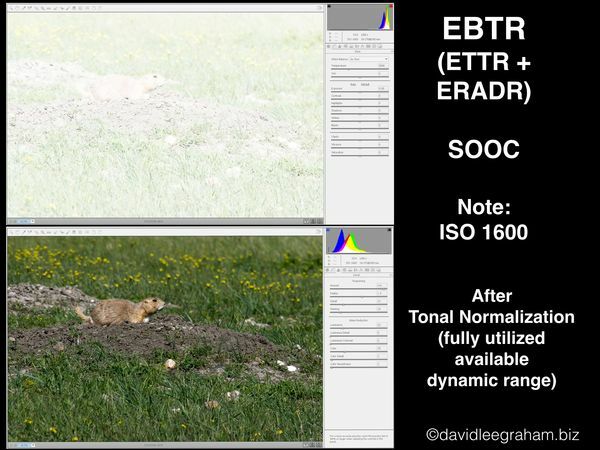 So experiment (as described below) and find out how much extra raw-accessible dynamic range (ERADR) your camera actually has! And if you really need another reason to use that extra dynamic range it is that you can capture your image data considerably farther "to the Right"...actually "Beyond the Right" (of the histogram frame) than before. "So what?" I hear you cry! Well, in so doing, you avoid the capture of most of the noise you used to capture in the darker, shadowy left end of the histogram frame...also known as the home of the "Mother Lode of Noise"
Does Your Camera Have for Raw Exposure? 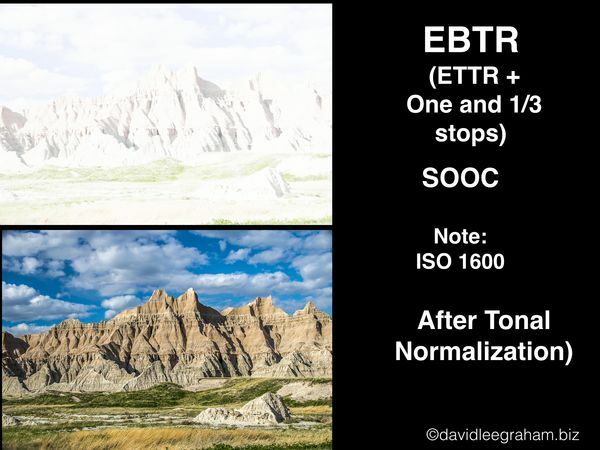 Here's the easiest way to get a handle on how much extra raw-accessible dynamic range (ERADR) your particular camera has at base ISO. On a somewhat overcast day (soft-edged shadows) find a scene with a dynamic range less than that of your sensor. In other words, a scene that produces a histogram that falls completely within your camera's histogram frame with no clipped shadows at the left (dark) end or clipped highlights at the right (bright) end.. Set the camera to its native ISO (usually ISO 100...or ISO 200 if you usually use that as the low end) Attach your camera to a sturdy tripod or other solid support. Then increase the exposure with progressively larger apertures (smaller F-Numbers) until the extreme right end of the "light pile" just barely "kisses" the right side of the histogram frame without triggering the highlight clipping warning "blinkies". Now, by increasing each subsequent exposure by 1/3 stop of shutter speed, add four full stops of exposure (that's twelve exposures, each 1/3 stop longer in shutter duration than the previous one). Download the image files into your raw converter. Open each exposure and tonally normalize it by left-sliding the "Exposure" slider. As each "washed out, too bright" image is tonally normalized, you'll see the histogram slide left and fully into the histogram frame. Do this in sequence until you find the histogram that contains a "spike" at the right end of the light pile that indicates blown highlight detail. Just a caution here... if the scene contained some specular highlights, then a very thin, one-pixel wide spike is permissible. If you see such a "specular highlight spike", go ahead and open the next frame, which will have a substantial spike of blown/clipped highlights at the right end of the light pile. The first three images below are from a series made to determine the amount of ERADR at ISO 200. First is the ETTR exposure. (1/200 sec) It is SOOC. Note that it has not been tonally normalized; its exposure has not been changed from default settings and the right end of the histogram comes as close as possible to the right side of the histogram frame without tripping highlight clipping warning. The next image shown (1/80 sec) is, counting the ETTR Image, the fifth in the series. It has been tonally normalized and is the last exposure in the series that did NOT reveal highlight clipping after normalization. The third, (1/60 sec) also tonally normalized, is the next in the test sequence and demonstrates the sharp "spike" of clipped highlights at the right end of its "light pile", even though tonally normalized as well as possible! ERADR = Four exposures = one and 1/3 stops ! The number of exposures between your brightest possible JPEG exposure (the ETTR exposure) and the first exposure with actual blown highlights( not just specular highlights) constitutes your camera's ERADR (Extra Raw-Accessible Dynamic Range). 3 exposures? one full stop. As ISO increases, the camera's amount of ERADR gradually and irregularly decreases. As an example, I've a camera that, at ISO 100 has one and 1/3 Stops of ERADR. At ISO 400 it drops to one full stop, and at ISO 3200 the ERADR is 2/3 stop. Why don't I just compile a list of camera brands and models and state the tested ERADR of each? Because three camera's of the same make and model can have three different amounts of ERADR at a given ISO! So, I'm sorry...but you just gotta test each individual camera! So, how do you actually use that ERADR once determined? Set your exposure as for a JPEG file using your camera's meter, a hand-held reflective, spot-reading, or incident light meter. Enter the exposure into your camera, and, adjust that exposure so that the right end of the "light pile" of the histogram moves right to barely kiss the right side of the histogram frame juuuuuust before clipping the highlights clipping warning/the "blinkies". It doesn't matter if the the right end of the light pile is a sizeable "lump" or a just a slender white line extending along the frame's base. When it just barely touches the right side of the frame. THAT is the ETTR exposure -your starting point. THEN.... add your known stops of ERADR using either slower shutter speeds or larger apertures (or a combination) and make your exposure. Note: Most who regularly use EBTR normally use 1/3 stop less than their established ERADR ,just to " play it safe" as regards possibly clipping highlights. Why "play it safe"? Because in many camera's there is often some inaccuracy in tripping the "blinkies". When you start using that extra dynamic range, realize that your camera's LCD display of the viewed thumbnail will, with most scenes, likely appear "washed out" with "blown highlights" (because it "thinks" it is displaying an "overexposed" JPEG file instead of a correctly exposed raw image file. So... DO NOT INTERPRET SUCH WASHED-OUT IMAGES AS "OVEREXPOSED"!!! THEY ARE CORRECTLY EXPOSED RAW IMAGE DATA FILES !!! Download the files into your computer's raw converter (Adobe Camera Raw is fine), move the "Exposure" slider to the left, and you'll see the image become tonally normalized with its full, expected tonal range and tonal spectrum! 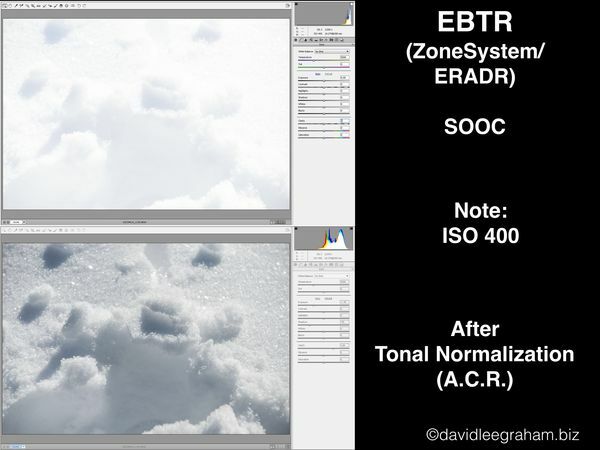 When you are new to EBTR, every time you tonally normalize a washed-out image, it's like a miracle to watch that tonally perfect image appear right before your eyes! It sort of reminds me of watching an image appear in a print in the developing tray under the dim green safelight in my dad's darkroom in the late 1940s. "So what's the big deal about a measly Stop? "C'mon, Dave, are you really telling me that just one measly stop is really worth all this trouble?" So I ask him, "What's your best, fastest lens? "we'll, would you mind if I took your lens and superglued it so it it couldn't open up beyond f/2 ?" "What if you couldn't, simply by increasing raw exposure by one stop, significantly reduce the amount of noise you routinely capture?" "Think of the times that limited illumination have made you wish for "just one more "measly" stop?" Yeah, I'd say there's considerable advantage to getting every bit of extra dynamic range as you can out of that sensor that amounted to 2/3 of the cost of that new camera body you just bought! Here we're talking about pulling out, at the very least, 2/3 stop of exposure up to possibly more than three stops of exposure beyond what your camera's lying JPEG-adjusted histogram suggests you can actually use! Below (lower than the three exposures from the ERADR test series) are some examples of SOOC (straight out of camera) and post-tonal normalization images. 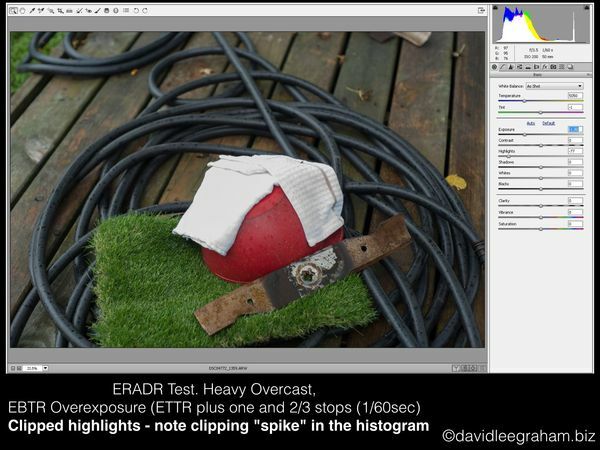 The abbreviation "EBTR" used in the images refers to "Expose Beyond the Right" - the technique of utilizing that extra dynamic range your camera has when you are exposing for and capturing Raw image data files. Welcome to the wonderful world of Raw image data capture. Learn to use all of your your camera's dynamic range. It's obviously well worth the effort. Spend some time on the tutorial. It stands by itself. A very timely tutorial for me having just recently purchased a DSLR capable of RAW. As you know Dave you not have to preach to me but for anyone out there who is not shooting Raw images and not exposing to the right of the histogram please try the techniques outlined here. They are life changing in a photographic sense and you will never look back. Thanks, much, Billy! Coming from you that is, indeed, valued praise. You are very welcome, Dan. I recall, after a half century of emulsion and darkroom photography being somewhat at loose ends with "JPEG digital" and then how the sense of unleashed horizons was opened before me by my first RAW-delivering camera in August of 2003, a Sony DSC-F828; an 8 Mp camera with a superb Zeiss lens that I still use! Do let me know if I can be of any further help. Thanks, Dave. I'm just beginning to feel some comfort level with exposing raw images. I'm not sure if I understand every point made, but I definitely get the stopping down, extra data part and dynamic range benefits. A well composed JPEG with disappointing exposure should be convincing enough to try exposing a raw image. With me you are also preaching to the converted. Been using Raw for a number of years now and it does radically change the way you set up, take and process pics. Dave, a nice clear and easy to follow tutorial for anyone just starting our on the road to RAW. And if you are serious about photography and you are not on that road yet then its time to get off the deckchair and start the journey. Wow! Thank you, Dave! Thank you for taking the time to put this together and do so in a way that a "newbie" is better able to understand. I have started shooting in Raw & JPEG a few months ago, and wish I hadn't waited so long to try it. I'm going to read your article several more times, hoping more information sinks in with each reading. I'm also trying to make myself learn to go full Manual, but I'm having a hard time letting go of Aperature Priority. I have so much to learn! Thank you for sharing your knowledge!! it is good to hear from you, and Billy, and others of the "Raw converted" whose photography is obviously at a an admirable, exemplary level that my evangelism and explanatory paths are on the right track! For the sake of those not on board yet, I very much appreciate your comments. I'm delighted to hear that you find the "tute" helpful. No question, it can't be fully absorbed and internalized in one large "gulp"! Please do let me know when questions arise, and I, and I'm sure others also will be glad to help you up the steeper stretches of the learning curve. I know some have found that adoption of the EBTR technique has helped them become more comfortable with "full manual". And remember, understanding Manual is no more important than understanding when Shutter Priority and Aperture Priority are appropriate to use. Nothing but excellent Dave. Thanks for posting.